The desire of The Doggy Den is to provide a safe, clean, and fun environment where dogs can enjoy their day while their owner is away! Many pets spend the day in a cage, pen, or alone in the house. 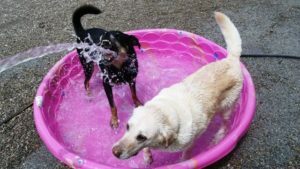 At the Doggy Den, our guests can exercise in the indoor and outdoor play areas, splash in the wading pools, and play together, satisfying the pack instinct. There are also areas to take naps and have a session with a professional groomer. Baths and pet-a-cures are available too! Our facility is personally supervised daily by the owners, and staffed with professional and passionate dog lovers! We welcome your special family member to stay with their friends at The Doggy Den, and join our family whenever you can’t be with them at home. 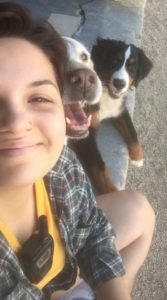 Why would anyone take their dog to daycare? Our dogs miss us as soon as we leave the house and can’t wait to greet with us when we come back! If you have a dog, you see the pure joy and excitement in their eyes when they have someone to spend time with. Doggy daycare provides a place where dogs can be dogs, where the “rules” are few, and fun is the order of the day! Our dogs need to run, socialize, and belong. They need daycare because, just like us, they are relational “people”. At The Doggy Den, our guests run to the door that leads to the play yard, anxious to see their friends on the other side and excited to rejoin the pack for another day. Meet our newest Dog Of The Week, Olive! Olive is a 12 year old Boston Terrier mix! She is such a sweet and loving girl. She loves to play with her friends Zibby, Breeze, and Moxie! Say hello to our newest Dog Of The Week, Chief! Chief is an amazing German Shepherd! He is a very sweet and loyal boy. He loves to play with his friends Sam, Evie, and Minnie! Meet our newest Dog Of The Week, Fleck! Fleck is a 1 year old Beagle/Cavalier King Charles mix! He is a super sweet and fun boy. He loves to play with his friends Deuce, Cassius, Niko, and Zibby!